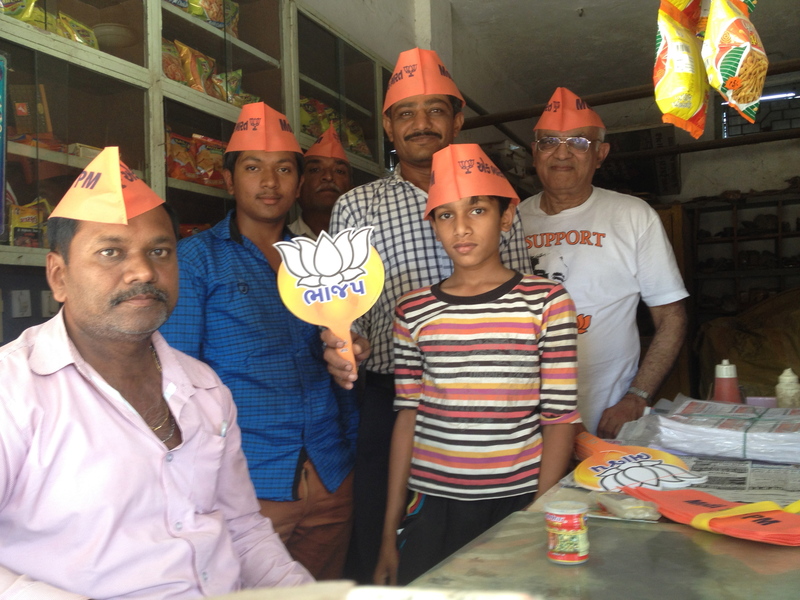 I spent three days (April 22 to 24) campaigning in Junagadh district and covered Junagadh, Visavadar and Bhesan talukas. 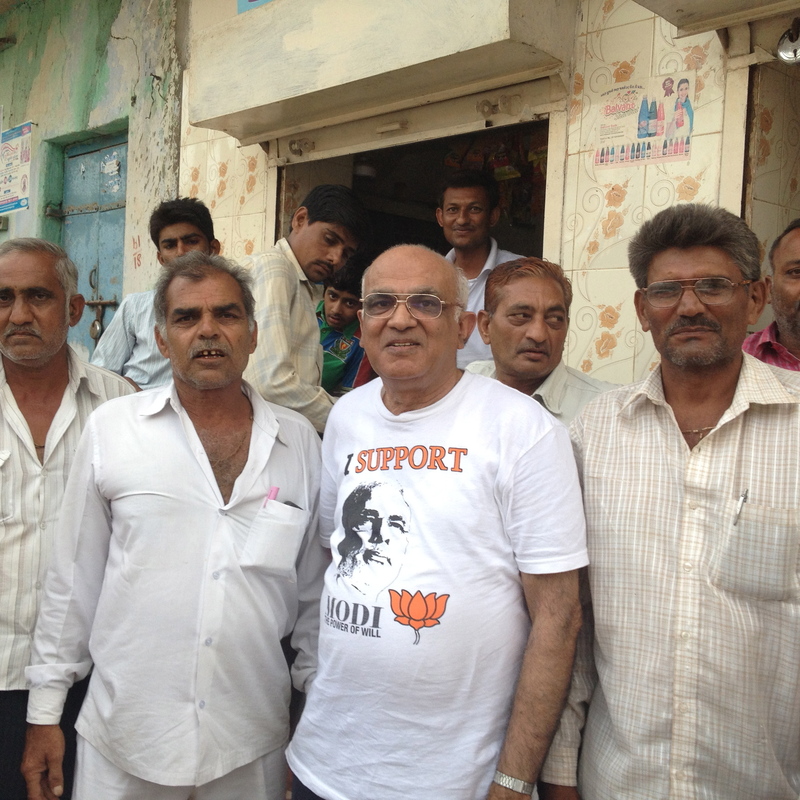 I also spent half a day in Mendarada taluka, which is part of Porbandar district. I was aided by GIBV (Global Indians for Bharat Vikas) team on ground led by one Dhirubhai Savaliya. These are the villages I had a chance to visit and talk with people. A typical day would start around 9:30 AM and end at 8:30 PM. We would pile in a rented car (no party funds) and travel to various villages. This wasn’t a door-to-door campaign but more of meeting with village head or influential persons in the village. They would have good assessment of how the village would vote. I had different people traveling with me every day, some being common. The number in our party would be as low as three and as high as seven. On of them was an Ayurvedic doctor, one was a Naturopathy doctor and one was a lawyer. All of these were Patels and involved with farming. One day Ukabhai Patlodia, president of Junagadh District Bharatiya Kishan Sangh, accompanied us. I could see that he commanded total respect wherever we went. It was almost as if his was God’s word. 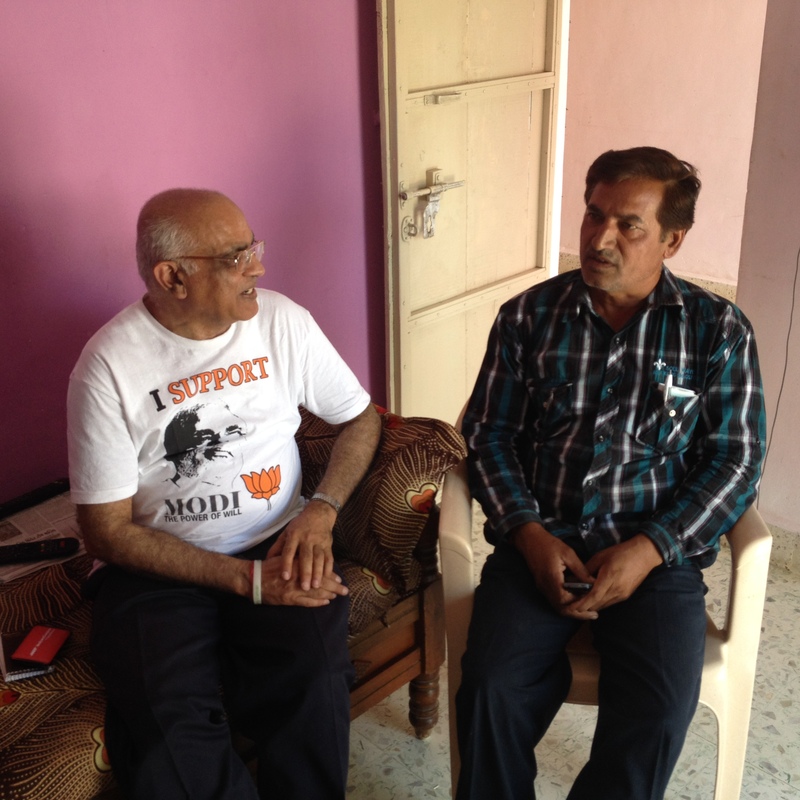 Other day, I had Ravinbhai Dudhatra, the Naturopathy doctor who knew each and everyone in villages that we visited in Mendarda Taluka. It was clear to me that all these volunteers had spent years cultivating relations with these villages through their association with Vishwa Hindu Parishad, BJP, RSS and/or Gau Raksha movement. One cannot help but appreciate ground level work of RSS. Wherever we went, we were received with warmth except at couple of places to which I will come later. I had observed strict rule of not eating any solid food during the daytime while campaigning to preserve my health (at least up until May 10th, last day of campaigning) but I could not refuse offer of cold drinks like water, lemon-water, sherbet, (I don’t take tea or coffee) etc., and villagers in Saurashtra (western Gujarat) are known for their hospitality. Besides, heat was scorching. Highest temperature on a given day would be around 102-105 f. degrees. In three days I drank liquid that I would drink in a month at home! We met with sarpanchs, farmers’ leaders, business leaders, etc. and also visited a couple of election offices of BJP. Here are my observations: The election on Junagadh seat is fought on caste lines and unfortunately this is true in all of Gujarat. 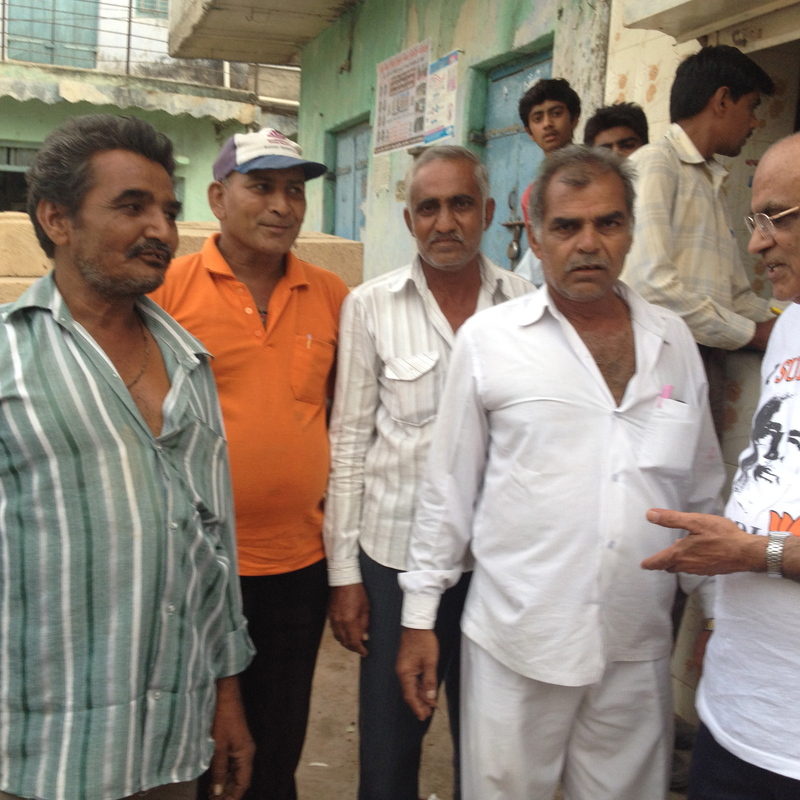 In Junagadh, voters we met with were predominantly Leua Patels (Keshubhai Patel’s caste). BJP candidate is Rajesh Chudasama a Koli Patel who is a sitting MLA. Congress candidate, Punjabhai Vansh is also a Koli Patel who is a senior MLA with good record. 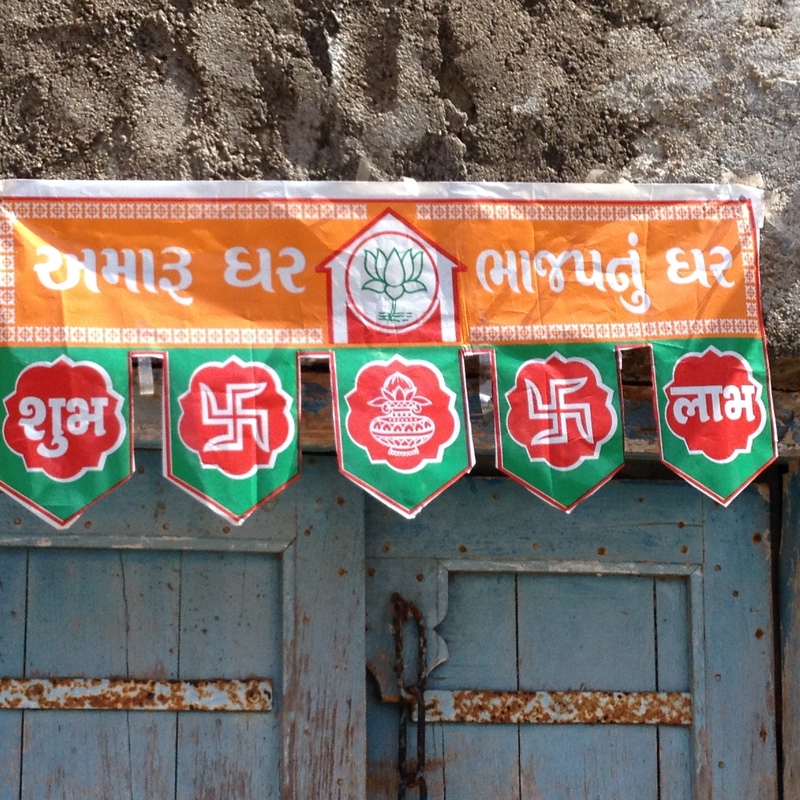 Koli Patels are evenly divided in supporting either candidate. Problem for BJP is the by-election to Visavadar MLA’s seat. Keshubhai has vacated it for his son, Bharat Patel (a price he extracted from Modiji to merge his failed GPP party with BJP). Farmers are vociferously opposed to Bharat Patel because they feel that those who have toiled for years are marginalized and a rank outsider, known for his corrupt ways has been foisted upon them. Add to this the fact that the Congress candidate, Harshadbhai for Visavadar MLA seat has been known to take care of the day to day problems of the farmers. We repeatedly heard in the Visavadar Taluka villages a question- “how can we not vote for Harshadbhai?” Another fear the villages have is that, Keshubhai didn’t do much for them in his 15 years career, including being a C. M. and now they would be stuck with Bharat Patel for another 15 years. BJP has to confront the reality that these farmers, who are eager to vote for the Congress candidate at MLA level, would likely also push the Congress button for M. P. candidate too. This would harm Mr. Chudasma, unless he covers enough ground in other talukas where there is no by-election. Our job was cut out. We had to explain to them the importance of keeping eye on the top prize, that is to make Narendra Modi the P.M., which would be possible only of they consciously voted for BJP candidate at national level. It was at least good to see that practically everyone we met had high praise for Modiji and wanted to see him win. It is clear that though this is the national election, average villager is looking only at his local problem and day to day issues that he has to grapple with. Another thing I noticed was that these villages would vote en-bloc for a chosen candidate and most likely they would listen to the village head or any other influential leader. Except for villages in Visavadar Taluka, there was resounding vote for Modiji. 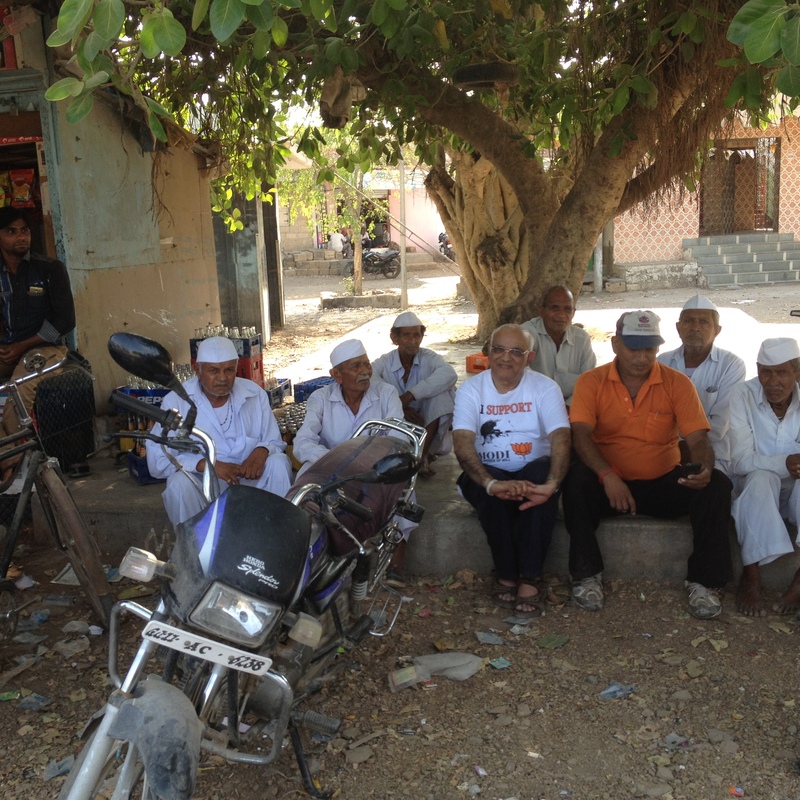 With the village elders under a tree (Chai Pe Charcha? In a village called Khadpipli, we met with well to do farmers who are known to be scrupulously honest and against corruption. They had nothing but praise for Modiji. Now I come to two experiences that were eye opener. We were at one village at the fag end of the day. We set on charpais and chairs and the local person started talking about election. The host, a man of may be 30-35 years, immediately retorted- if you have come here to talk about Kishan Sangh, then you are most welcome, but if you have come here to talk about politics, you are not welcome. Sensing his anger, we turned around the subject. I asked him as to what bothered him. A litany of issues came out like a torrent. He also had a colleague, a RSS trained young degreed engineer who put the grievances more sophisticatedly. Three issues stood out. (1)Forest department’s continuous harassment.- whenever an animal dies in a farm, the farmer is taken into custody, even if the animal has died of natural causes. A few moths back a lion had died and the farmers were arrested by the police and beaten mercilessly. No political leader of BJP came to their rescue. (2)GEB enforces new rule of Gujarat Government vehemently where one farm can only get one meter up to 10KWh. Farmers who have large holdings and need 30 kwh or more cannot get it, even if they are ready to pay extra for meters. This is a sore point. (3)Elected members do not care to show their faces or listen to the villagers, once they have gone to Gandhinagar. I was told by the engineer, Bharat Savaliya that they had gone to Gandhinagar for a representation and their MLA, who was very much in office there lied and told them that he was out of town. They did catch him red-handed when he emerged from his office. At a village in Junagadh Taluka, Patrapsar, we had another experience though for different reason. We were supposed to meet this person who had a shop in small village square. He and a few others came out, received us and offered cold drinks. When we talked about our mission, they told us that no one from the party (BJP) had visited them so far. The candidate, i.e., Bharat Patel had come to the next village but did not have time/courtesy to visit them. They had to listen to taunts from the opposition party because the party did not even send them any publicity material. They were quite agitated and it took us a while to calm them down. Apart from these incidences, which are the real barometer, it was smooth sailing. To my surprise, fact that someone from USA had come to meet them created a big and positive impression everywhere. Youth were quite enthused for Modiji. All in all, BJP will win but we should not be under the illusion that it will be a cakewalk. Positive part is that those who are bothered with local issues also understand importance of a Modi win and most likely will vote strategically. P.S. : I had taken a non-AC train from Amdavad to Junagadh to be with the “common man”. It was a good experience. Person seating next to me was a well educated (Master’s level) and had decided to takeover his father’s business of barbershop rather than working for someone else. He had a lot of negative feelings for things around, but was positive that Modiji would win. He was proud of the fact that the actor Paresh Rawal, who is a BJP candidate from Amdavad, East had called him home for his services. Another person sitting next to me was an aged Sunni Muslim who was in charge of a mosque in the town of Wankaner. He was quite sober and while he did not outright endorse Modiji, he gave indication that people should vote for their betterment. There was also another Muslim couple sitting across from me with their two teenage sons. This guy was a “rekadi wala”, meaning pushcart hawker. I was talking with his wife and the elder son who was in 10th. I told him about Modiji’s idea of having Quran in one hand and computer in another. The message was received without any apparent hesitation. Lastly, the religious head of the Muslim Bohra community, whom they consider almost as God was traveling by another train so at every medium to big size station, there were the followers (they are Shia and were Brahmins before forced conversion) by hundreds. They were decked in their best attire, old, young, man, woman, children- all – and it looked like a big festival. They had erected makeshift podium on those stations. I was told that the Dharmaguru’s train was running late by hours, as he had to stop at all these stations to speak for a few minutes. I must end this report with heartfelt thanks to Global Indians for Bharat Vikas (GIBV), Amdavad office for making arrangements for my campaign and also to all individual volunteers in Junagadh who were diligent, knowledgeable, persuasive, accommodating and pleasant company. Posted on April 30, 2014, in Blogs, Election-2014, Gujarat, Narendra Modi, Politics. Bookmark the permalink. 6 Comments. Excellent report. Best of luck. Excellent (unbiased)report where we need to improve. Makes proud of Sangh Parivar work. Dhanyavad for reporting reality on the ground. I am really proud of you . It goes without saying that i have always been sweetly jealous of your writing skill, but now i am also jealous of your stamina , btw I have never seen you this happy. Even for your sake I pray that he wins with clear majority .Take good care of your health and come back soon after accomplishing mission. Best of luck. Memory trail for me.My landlord in Junagadh (1971-72) was from Vadal village featured in this report.Visavadar,Manavadar, Bhesan,Bilkha,Majevadi … all these places remind me of my stay in Junagadh which was a small place then.I visited these and all other villages nearer and upto Porbander like Kutiyana etc. Porbander was not a seperate district then. I APPRECIATE YOUR CONCERN AND LOVE FOR CITIZENS OF YOUR MOTHERCOUNTRY.YOUR REPORT AS WELL AS ANALYSIS IS EXCELLENT.FROM DISTANT COUNTRY , YOU CAN VERY WELL APPRECIATE THE BASIC DRAWBACKS IN INDIAN POLITICAL SYSTEM.I HOPE INDIA BECOME `CONGRESS MUKT` UNDER LEADERSHIP OF NARENDRA MODI AS PM.